This spring has been dry. 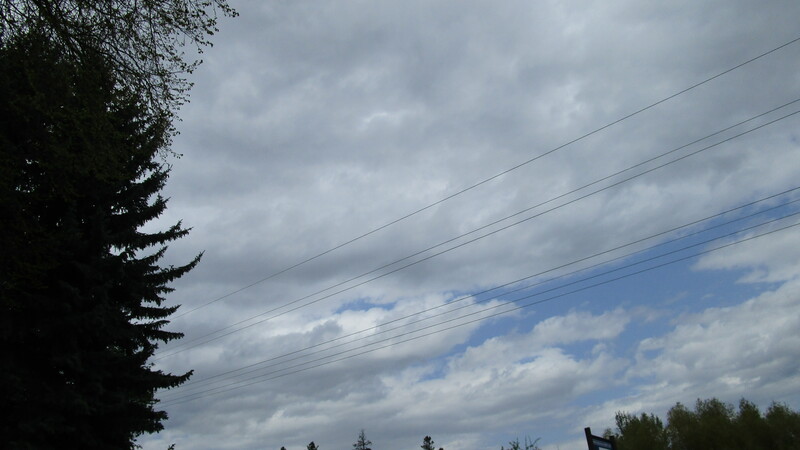 Most conversations at garden and grocery stores have been, “Where is the rain?”. A great excuse to talk about the weather to either vent on how dry it is or to simply start a ‘plain’ conversation. While some US States are flooded, in Montana we ask the above question. 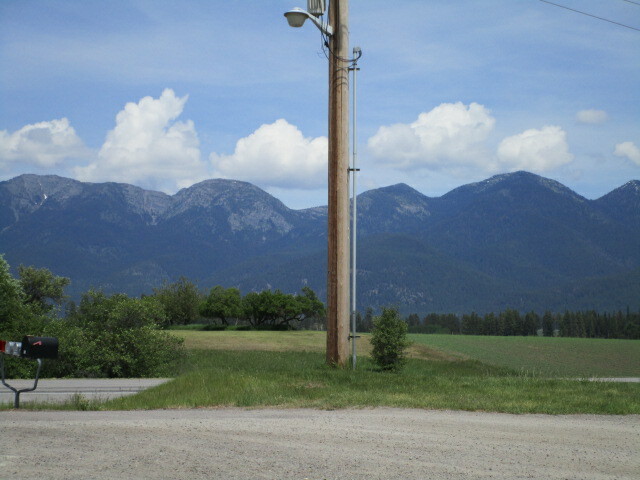 The photo below is a view from NWARC with snow-free mountain peaks. Definitely, last year was a different story. 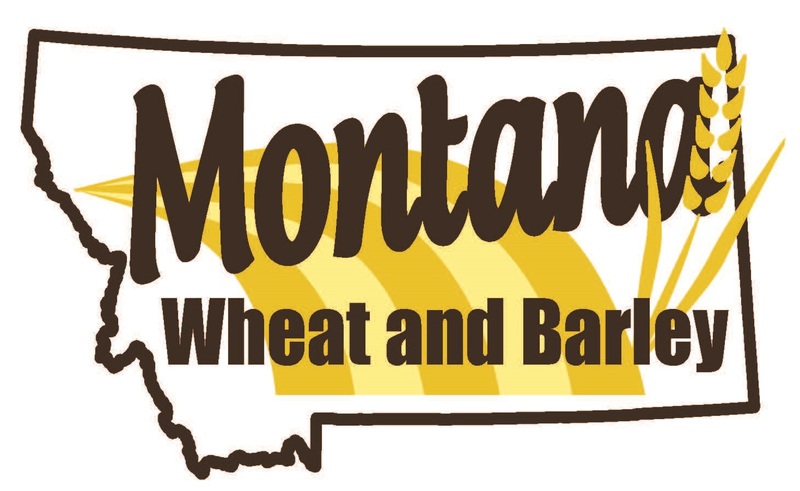 This year, Kent McVay, Paul Stoy, and myself, went ahead and submitted a grant proposal to Montana Wheat and Barley Committee to validate crop coefficients (Kc) to better irrigation scheduling. Kc is crop specific and varies during the course of the growing season. 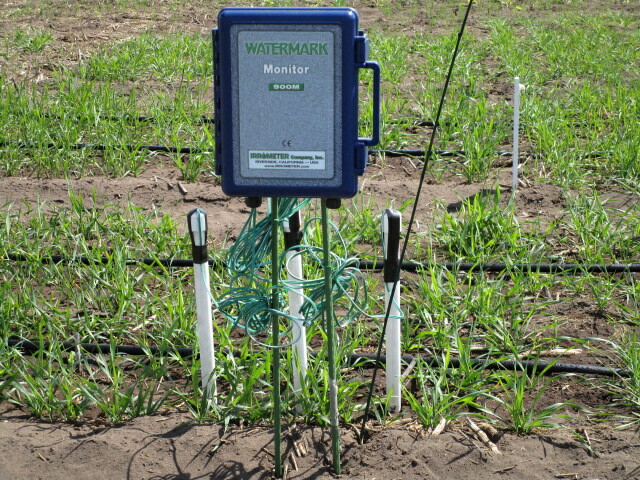 It is used to estimate crop water use, or transpiration (partially), or engineers/scientists call it crop evapotranspiration (ETc). It is a multiplicand to the reference evapotranspiration (ETo) in order to estimate ETc (ETc = ETo x Kc). movements). 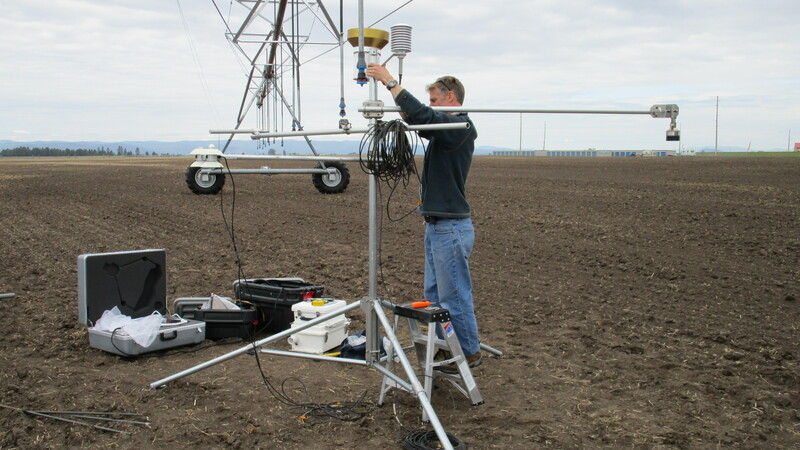 Eddies that are in contact with the surface of a plant or canopy can pick up water vapor or sensible heat used to measure surface water loss, referred as evapotranspiration. 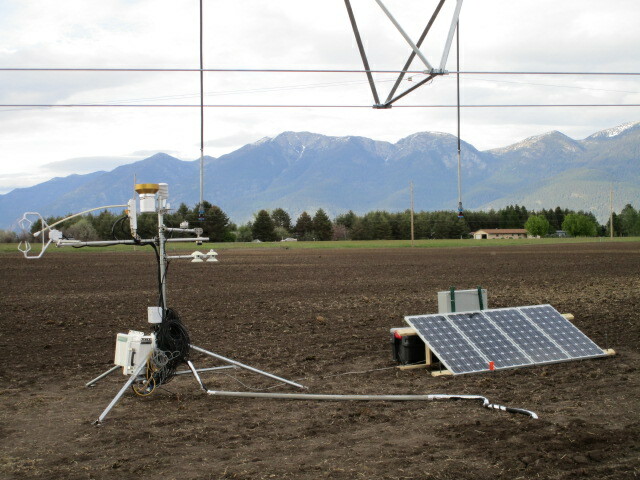 EC Tower installed on May 15, 2015 in farmer’s spring wheat field. Thank you James for your technical expertise in the installation/programming, and Paul Stoy for these towers. The NWARC field day will be in June 24, 2015. I will be discussing primarily on irrigation practices for spring wheat, plus, the EC Tower that you might have seen as you drive closer to NWARC along MT 35. Where is the rain? I still ask that question. On a good note, it will be good for irrigation research and how various spring wheat varieties respond to various irrigation strategies towards improved recommendations on water management x spring wheat varieties for yield and quality. 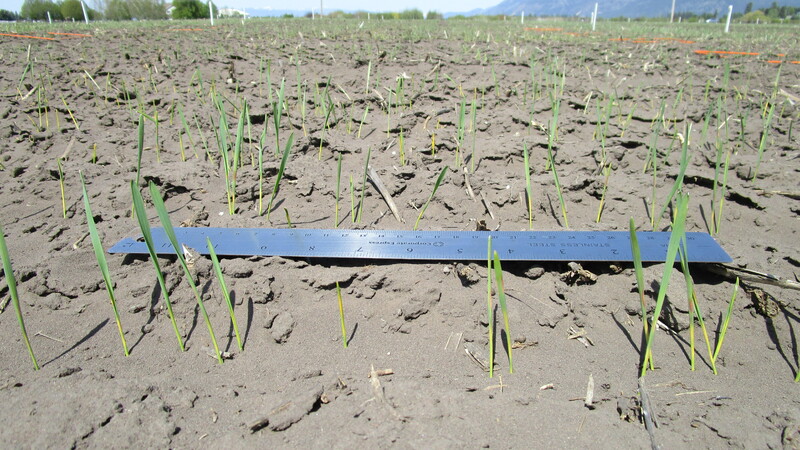 On May 29, 2015, irrigation was triggered for spring wheat that was planted on April 22 on a fine sandy loam soil. Plants here have 4-5 leaves and are tillering – the stage where crop water requirement increases. 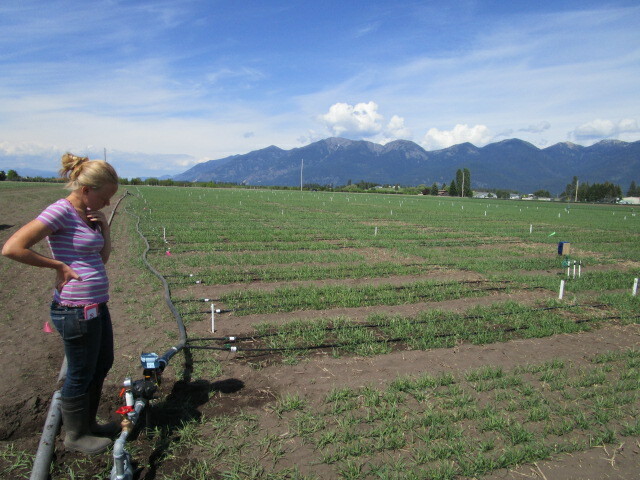 In the photo is Marcelle Tikka- research assistant, inspecting the drip irrigation timer. 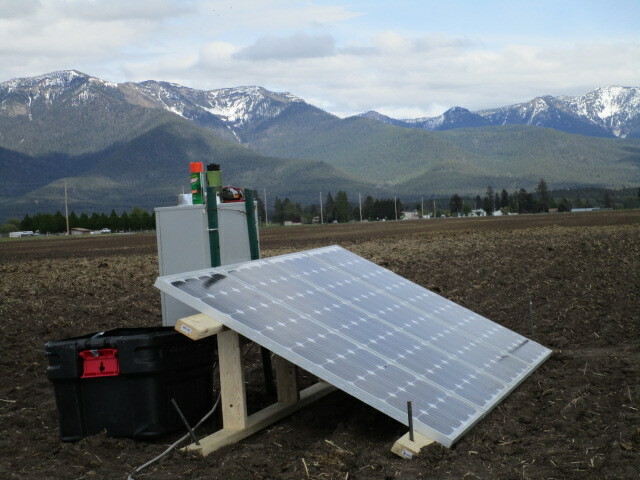 The blue monitor is logging soil water depletion in centibars [Irrometer, Inc] to complement soil-water-balance approach. 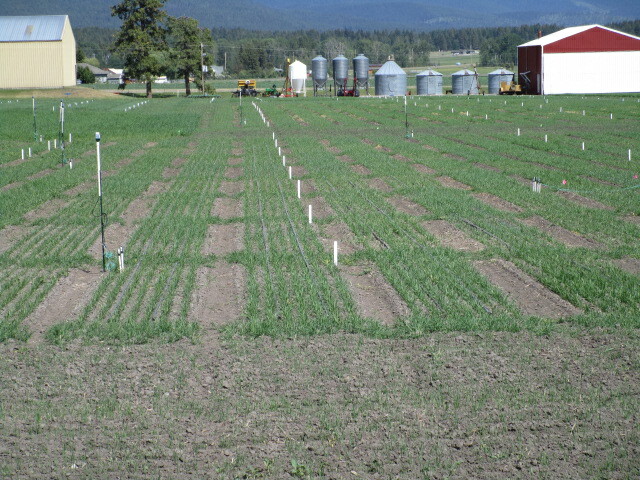 A view of the water use efficiency studies in fine sandy loam and silt loam soils. Thank you Montana Wheat and Barley Committee for funding another year to this irrigation study. Emergence irregularity is often observed on coarse-textured soil (sandy soil: sandy loam, fine to very fine sandy loam). There are spots in the field that retains more moisture ; some well-compacted to achieve better contact with seed for germination. In drier areas of the field, germination can be delayed. Dry spring aggravates germination irregularity. Producers run their center-pivot sprinklers in spring for the first time during the cropping season to achieve better germination and, attain plant growth uniformity. 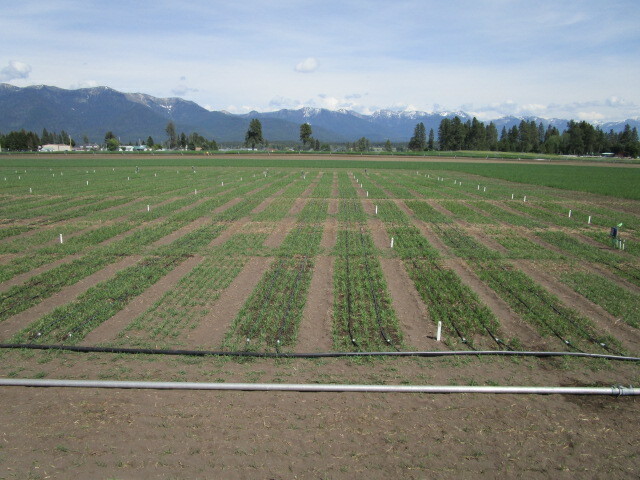 The above photo shows a portion of the field with spring wheat seeds emerged. 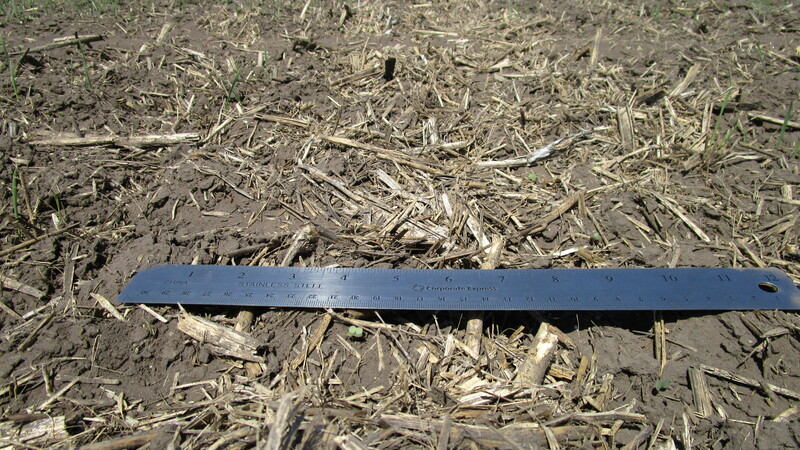 The above photo shows a portion of the field (just few feet next to the first photo above) with no emergence. In this field there are canola residues from previous year. Traditionally, we think residues in the field will help keep moisture and reduce evapotranspiration – loss of water from surface soil. It is important to note that there are multitudes of advantages returning residues to the ground. On a fortuitous dry spring/year, however, residue may dry up the surface even more. 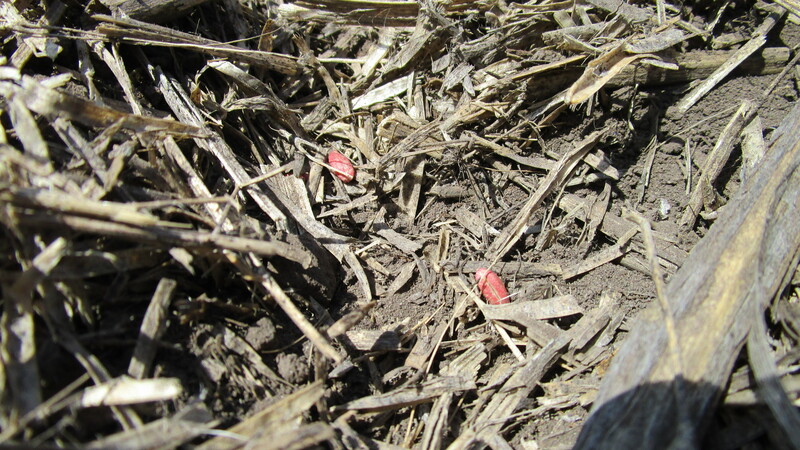 Dry residue on a dry spring (on a coarse-textured soil) may have reduced seed to soil contact and thus, exacerbates germination irregularities. See photo below with spring wheat seeds unable to germinate. On a dry spring (like this year), dryland production system or irrigated fields on a coarse soil where irrigation system is not yet in-place ready to use, can only hope for rain. This reminded me of a special prayer intention at times… ‘pray for rain’.